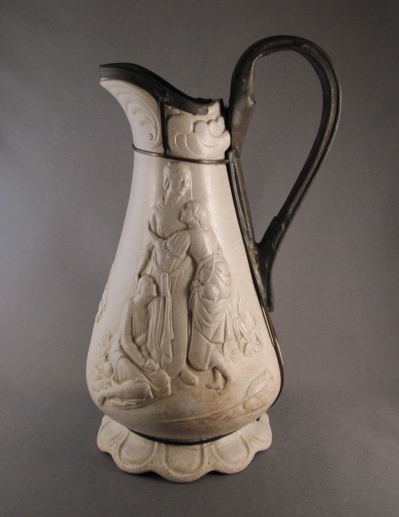 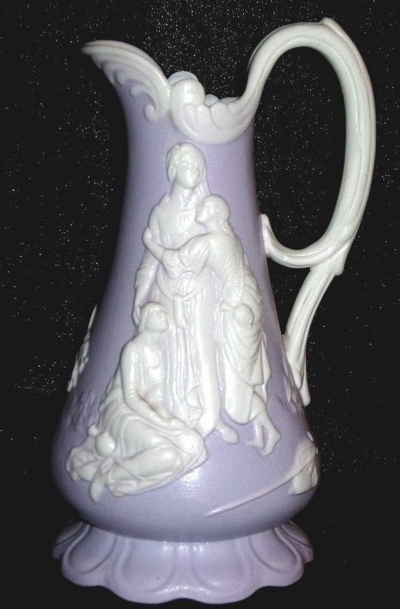 Parian salt glaze ewer with molded relief biblical design marked on the bottom: “Naomi and Her Daughters-in-Law”, made in the mid-1800’s by Samuel Alcock in Staffordshire, England. 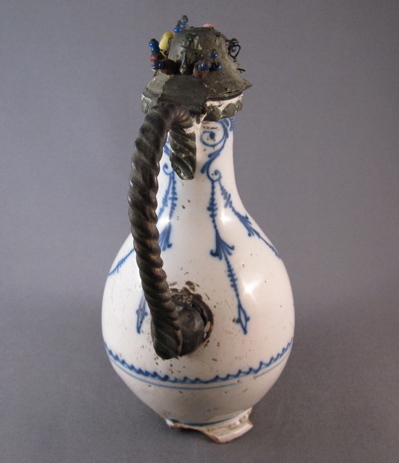 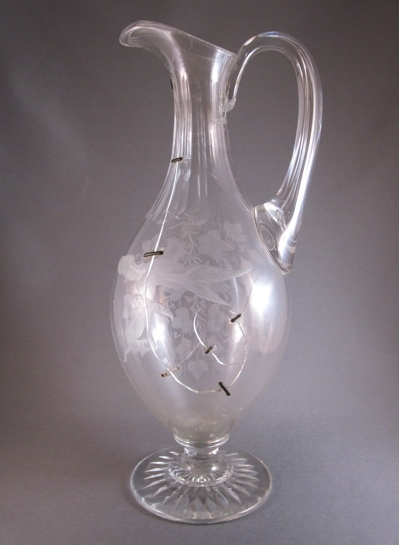 Ewer measures 9-1/2″ tall and has an intricately fashioned network of metal straps and wire. 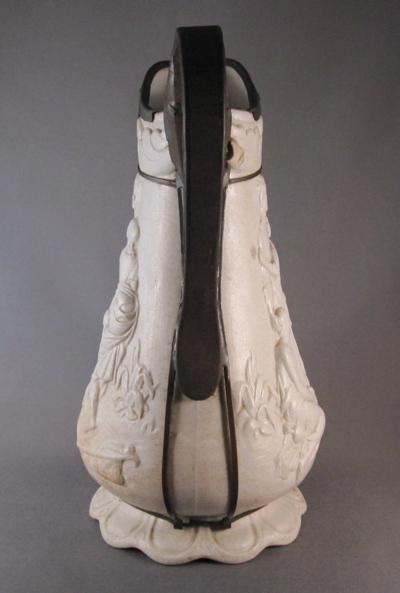 The large metal replacement handle stands in for the long gone original ceramic handle. A lavender ewer showing the original, more ornate handle. 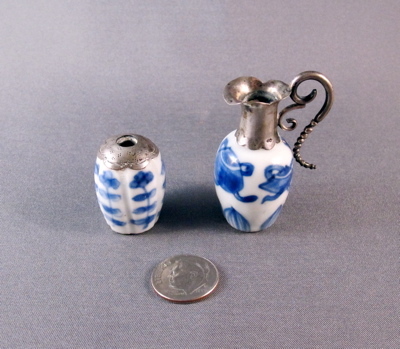 A pair of Chinese export porcelain dollhouse miniatures with blue underglaze decoration from the Kangxi period (1662-1722) with Dutch hallmarked silver mounts from the mid-1800’s. 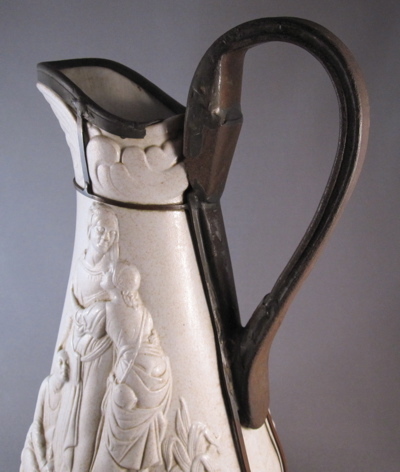 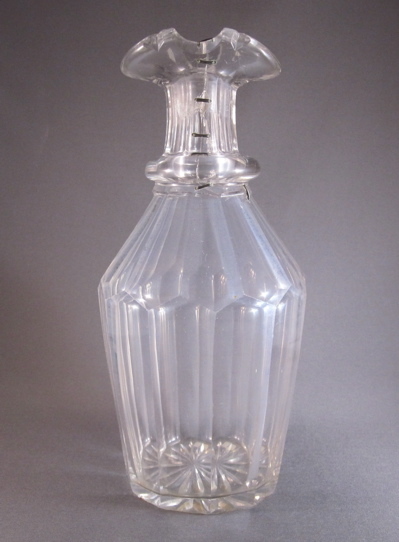 Once the neck broke off this vase, it became a ewer, standing 2″ high with its replacement handle and spout. 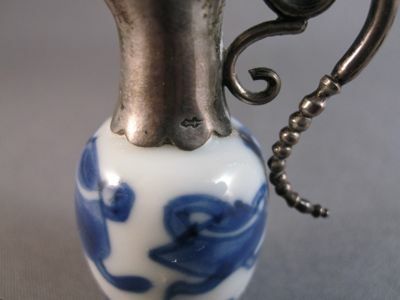 A tiny Dutch hallmark in the shape of a sword can be seen on the bottom of the replaced silver neck. 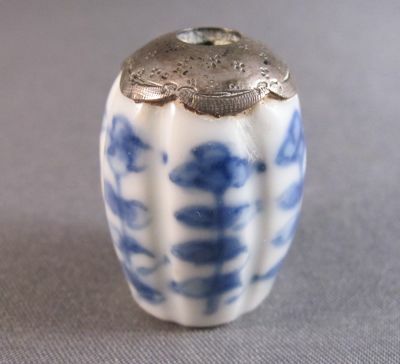 Between the years 1814 and 1905, sword marks were used on pieces too small to accommodate full hallmarks. 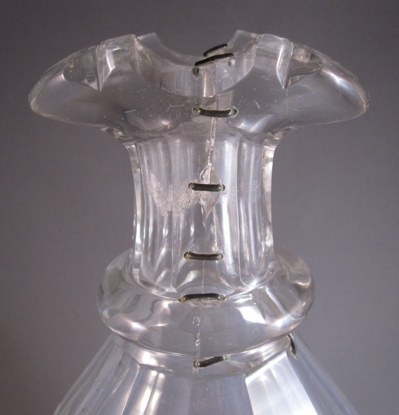 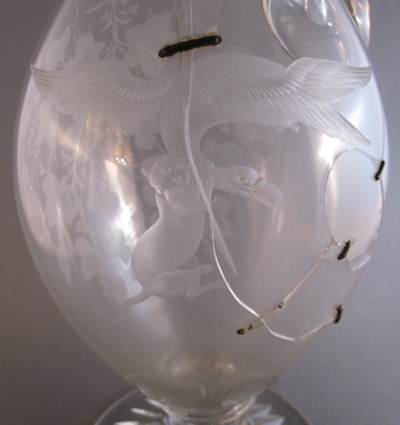 The remains of the broken porcelain vase’s neck are obscured by the silver replacement top but can still be seen looking down through the opening. 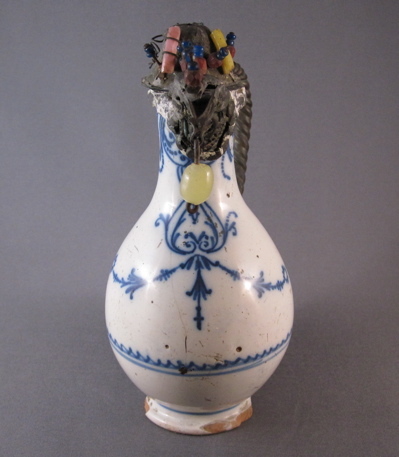 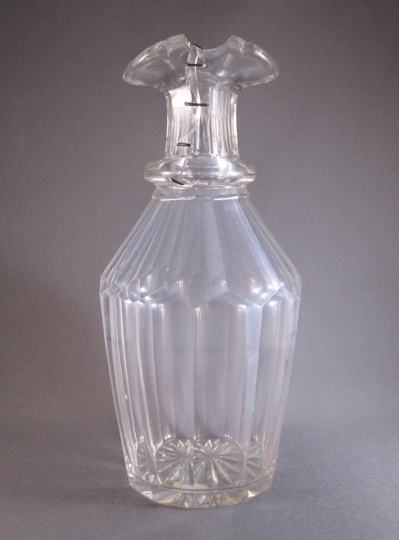 The other broken vase became a bottle, standing a mere 1″ high. 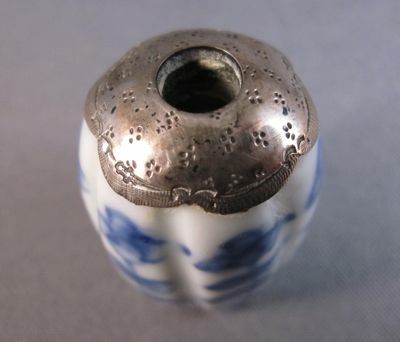 The broken top was masked by the addition of a beautifully engraved silver cap, with scalloped edge and stippled decoration. 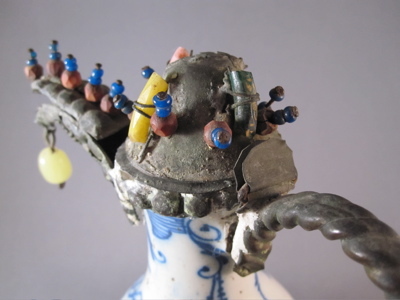 Miniatures such as these were displayed in doll houses owned by wealthy individuals and were not intended to be played with by children. 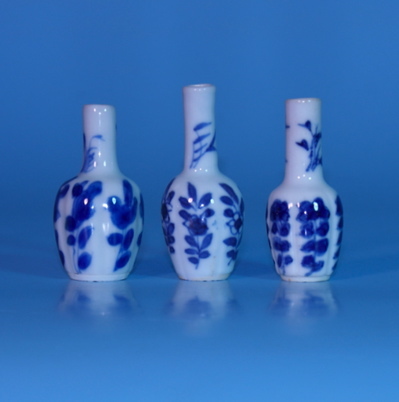 This is what the miniatures looked like before they became damaged and their appearances altered. 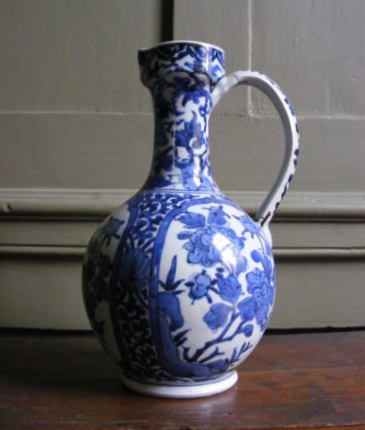 A French red body tin glazed earthenware ewer in traditional blue & white Delft decoration. 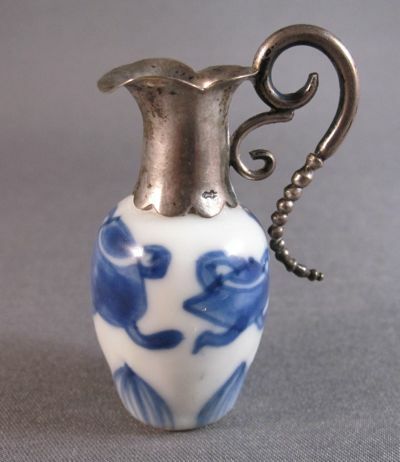 Made for export, most likely for the Persian market. 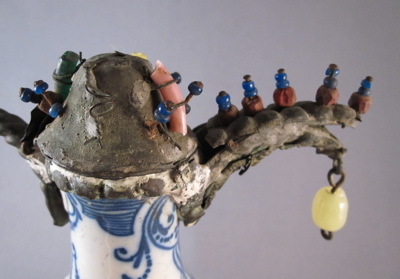 I found this unusual piece in an antique shop in Cold Spring Harbor, NY while working on the film Eat Pray Love as a set decorator. 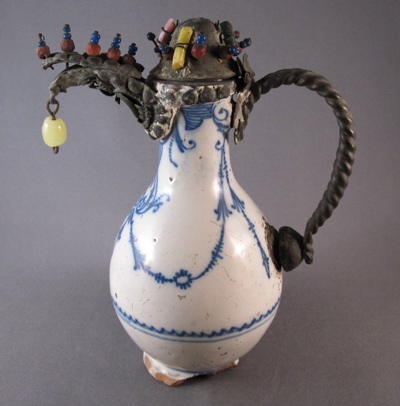 Elaborate metal mounts with dangling glass “jewels” replace the original ceramic spout, handle and cover. 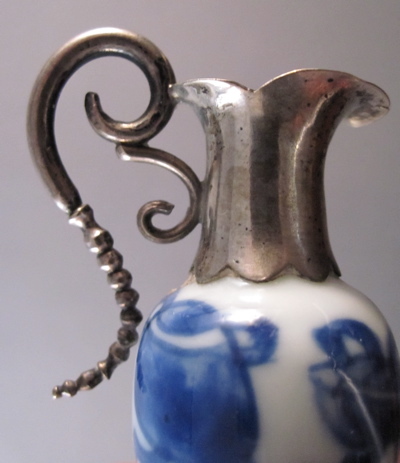 The metal twisted rope style handle replaces the original long-gone handle, which would have been much simpler in form. 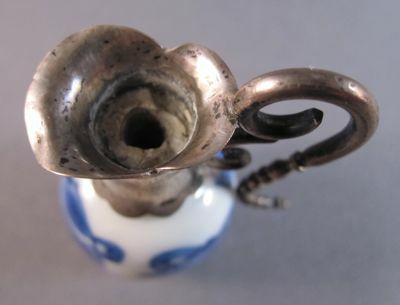 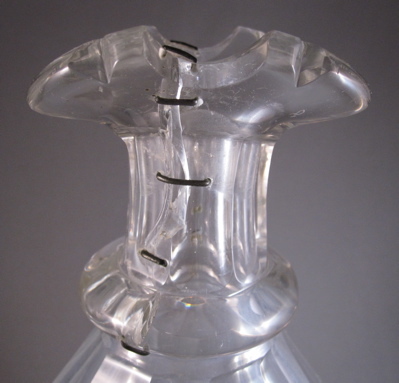 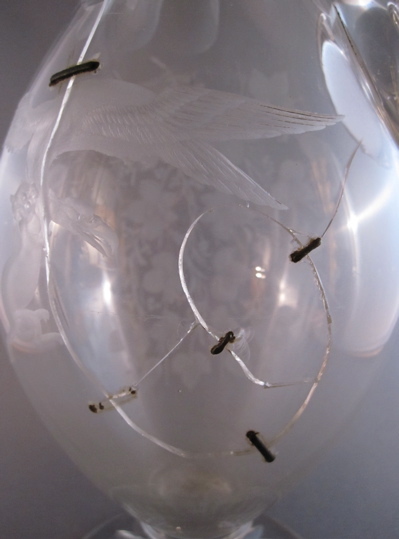 It attaches at the bottom of the ewer to the stub of the broken handle. 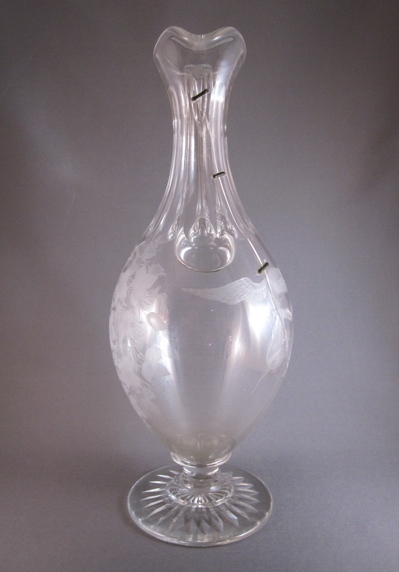 Decorative multi-color glass beads are wired on to the metal cover and spout. 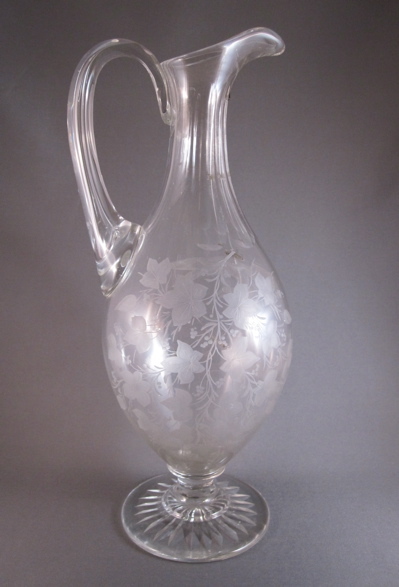 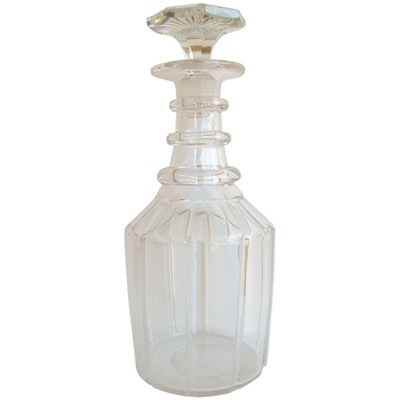 The ewer has a delicate baluster form and measures 6-1/2” high. 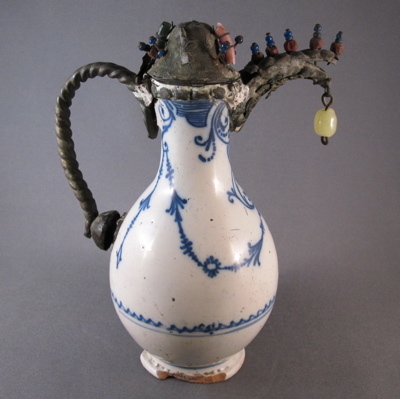 This similarly shaped ewer still sports its original handle and spout, although to me it looks a bit naked without the fanciful adornments found on my ewer.